The 2008 DCI Eastern Classic consisted of two exciting days of late-season drum corps competition on Aug. 1 and 2 in Allentown, Pa. During the Friday night event, the Cavaliers stunned many by passing up the Blue Devils who had spent the first 42 days of the 50-day Drum Corps International Summer Tour undefeated. The next day, Phantom Regiment started its late competitive surge on the way to the 2008 World Championship title, taking the gold medal under the lights of J. Birney Crum Stadium just after audience members had been treated to a very special exhibition performance by the Bridgemen Alumni Corps. 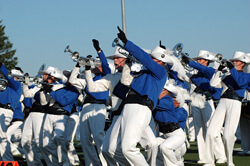 Check out this photo gallery from the 2008 DCI Eastern Classic. Photos by David Rhodenbaugh.